We helped bring Oxford Economics, a global advisory firm, into a new era of delivering context-rich, event-driven economic analysis to its customers. Oxford Economics is one of the world’s foremost independent global advisory firms, providing businesses and global organizations with reports, forecasts and analytical tools using data from 190 countries, 100 industrial sectors and over 2,600 cities. It is a key adviser to corporate, financial and government decision-makers and thought leaders. Its worldwide client base comprises over 700 international organizations, including leading multinational companies and financial institutions, key government bodies and trade associations, universities, consultancies, and think tanks. Oxford Economics needed a clean, modern website that better demonstrated the company's proficiency and experience and reflected its leading position in the market. Their website houses the thousands of reports and analytical tools that their subscribers from around the world need to access on a daily basis. The main challenge was to make it easy for economists to upload information onto the website and for subscribers to easily find and access that information quickly and from anywhere. We determined the best way to meet their needs would be by developing not only a new website but also a customer portal for subscribers to access and personalize their content, an improved reports importer to make it easier to get content into the system, and a mobile app making the information accessible from anywhere at anytime. We built Oxford Economics a fully functional, brand new website that better integrated their core services and made it easy for subscribers to access information they need. We worked closely with the Oxford Economics Marketing Director to create the website's new design and to carefully craft an optimal user experience, which we then coded into the web application. With a fast, modern webpage and a user-friendly design, the site makes Oxford Economics' services even more convenient for their customers than ever before. As a critical component of the new website, we designed and built a new customer portal that allows subscribers more control over their content. They can choose what kind of information they want to receive, quickly and easily search the database as well as save specific reports for later and bookmark pertinent topics to receive updates in real time. A huge component of Oxford Economics' services is based on economic reports that are uploaded into the system for subscribers to access. After the website launch, we worked on migrating the existing database from the previous system to the new customer portal CMS. Since the reports are typically produced in MS Word, we needed to create a way for economists to easily upload their documents and then a way to categorize them and convert them to a more web-friendly format so that subscribers could readily find what they need. We coded a new importer program which gives economists the option to upload their documents automatically with a Word plug-in or manually on the website. The system then tags and categorizes the reports so that customers can access them through their portal. Oxford Economics' business strategy relies on providing its customers with critical information in real time, so we knew that a mobile app would be essential for their subscribers. 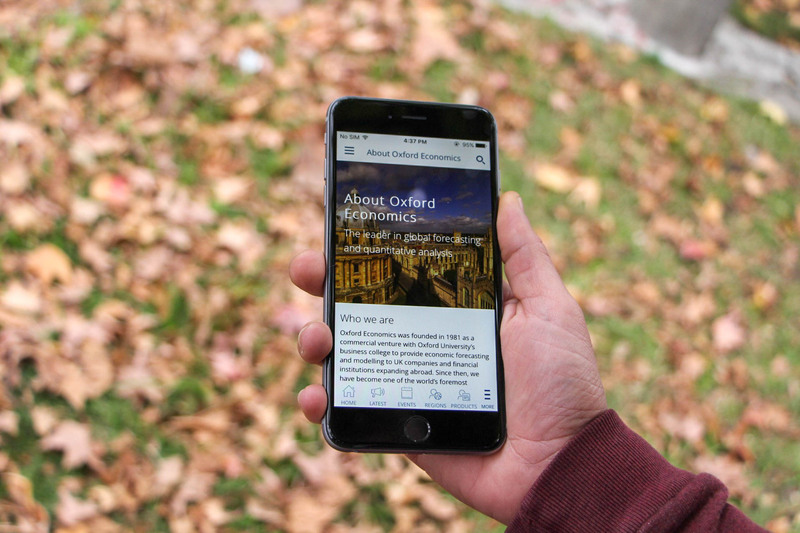 We designed and built a mobile app that provides Oxford Economics' customers with ubiquitous access to their subscription from anywhere. Using the app, customers can not only access their subscribed content and manage their subscription settings but also bookmark important reports to read later even without an internet connection. With a new technology suite adapted for the needs of an ever-changing and rapidly globalizing economy, Oxford Economics can continue to deliver context-rich event-driven economic analysis to their customers in real time. As Oxford Economics expands and grows their business, we work closely with them to make sure they have the software tools they need to get the job done and continue to deliver the best content for their customers in real time. We continue to work on making their systems ever more robust and faster so that service is always available no matter what and Oxford Economics' analysis reaches its customer base as quickly as possible.